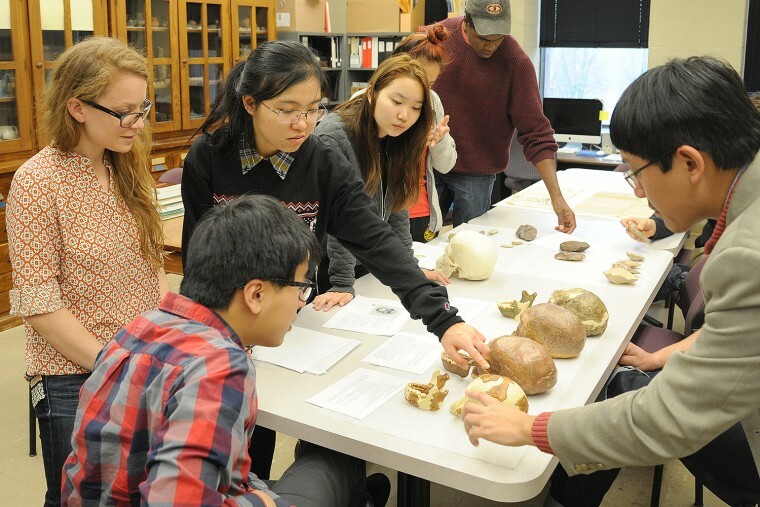 Artifacts housed in Wesleyan’s archaeology and anthropology collection can be used as teaching aides. In 2017, the Wesleyan Library began overseeing two programs. The Wesleyan Museum, which houses the university’s archaeology and anthropology collection, has moved under the library’s oversight. These materials, located in the Exley Science Center, contain a broad variety of unique items, including Middle Eastern artifacts, historical materials from 18th- and 19th- century Middletown, missionary-collected objects from South America and Native American pieces including pottery and jewelry. Jessie Cohen is the manager of the collection. The collection will eventually be discoverable through the library’s online catalog (OneSearch) so students and faculty will have the opportunity to find and physically work with historical objects alongside library materials that relate or speak to those objects. The library also acquired the Visual Resource Center (VRC), which was formerly called the slide library. The collection is now significantly digital and is used by many faculty to teach across all disciplines. The VRC is managed by Susan Passman and Digital Media Specialist Nara Giannella.